Hi friends today I share a special post for the ssc jen exam. SSC jen exam 2016 conduct in 3 to 5/12/2016 online mode so my friends I suggest you start you study ssc jen exam 2016 . here I provide some link and study material ssc jen exam 2016 I hope this help you your exam.My visitor know that this blog specially help all fresher engineer who prepare for govt. competitive exam like GATE, IES, PSU, SSC jen and engineering exam. I have posted here many post related to the ssc jen exam you daily visitor know about this but my new visitor not know so I post special post for the ssc jen exam. This post cover; all post and share direct link for related post. 2. SSC JE EXAM SYLLABUS ELECTRICAL, MECHANICAL, CIVIL. Age Limit: Candidates age limit should be up to 32 years for Post No. 01 to 04, between 18 – 27 years for Post No. 05 & 08, up to 30 years for Post No. 06 & 07, 09 to 14 as on 01-08-2016. Age Relaxation is applicable to 05 years for SC/ ST & 03 years for OBC and Other relaxation details refer the notification. Educational Qualification: Candidates should possess Diploma in Civil Engineering/ Electrical or Mechanical Engineering for Post No. 03 & 04, Three years Diploma or equivalent in Civil Engineering for Post No. 05, Degree in Civil Engineering/ Electrical or Mechanical Engineering or Three years Diploma in Civil Engineering/ Electrical or Mechanical Engineering or Passed Intermediate examination in Building and Quantity Surveying Sub Divisional-II of the institute of Surveyors (India) for Post No. 06 to 08, Degree or Diploma in Civil Engineering/ Mechanical Engineering for Post No. 11 & 12 from a recognised University/ Institute with relevant experience & other qualification details refer the notification. 1. 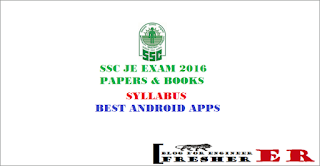 SSC JE EXAM 2016 PAPERS & BOOKS. 2. RS AGGARWAL ARUN SHARMA ABHIJIT GUPTA QUANTITATIV APTITUDE BOOKS PDF. Application Fee: Candidates should pay Rs. 100/- through SBI Challan / Net banking and any credit and debit cards. Women candidates and candidates belonging to Scheduled Caste, Scheduled Tribes, Physically handicapped and Ex Servicemen eligible for reservation are exempted from paying fee. How to Apply: Eligible candidates may apply online through the website www.ssconline.nic.in from 01-10-2016 to 28-10-2016 by 05:00 PM for Part I Registration & 31-10-2016 by 05:00 PM for Part II Registration. Here I am provie some book for buy online this book help you to crack your exam ssc jen 2016. 11. Now take printout of online application for future use . 1. ELECTRICAL FOR SSC JEN EXAM 2016. 1. 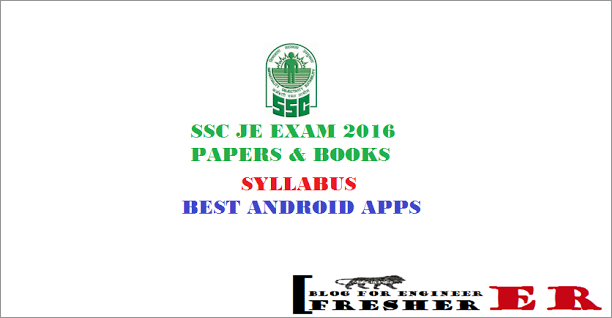 BEST 12 ANDROID APPS FOR SSC JE EXAM 2016. I hope this post help you for ssc jen exam.if you like this share with your friends and also subecribes your eemail for latest update.